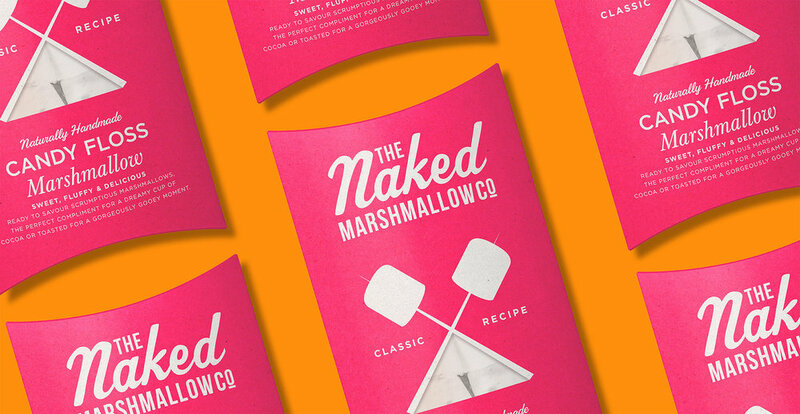 To design a brand and structural look and feel that encompassed Naked’s light hearted take on a campfire classic. After establishing the Naked brand we then moved on to include their brave new range extension, introducing real marshmallow infused Gin and Vodka to their portfolio. We amplified Naked's handmade proposition with an understated brand mark and iconic crossed sticks. A bespoke pillow box with a tent inspired diecut and bright & punchy colours added shelf appeal. Finally, textured kraft paper and a foiled belly band evoked premium credentials for the Gin and Vodka range. "Design Happy have totally transformed our brand. We now send samples and pich our products, feeling immensely confident and proud of what we have and that is owing to the eceptional design skills of the DH team. We've not only gained new listings, but have also seen a strong rise in sales. We really cannot recommend them enough!"